How do you get everything into the same unit? As you can infer from the sources of greenhouse gases above, you'll look through bills which may show kilowatt hours of electricity, therms of natural gas, gallons of gasoline and miles of airline travel. How do you compare these very different units? Fortunately, all of these different sources have been assigned a carbon-equivalent factor, a CO2-e, a multiplier that converts each of the disparate units into what is used as the base, carbon dioxide. So, for example, one gallon of gasoline is equivalent to roughly 19 lbs of CO2 and diesel has a CO2-e of 22. Here's a list of accepted conversion factors. Typically greenhouse gases are reported as pounds or metric tons of CO2-equivalents. (1 mT=2204 lbs.) Since those units are hard for people to visualize, the EPA has a web page where you can convert your greenhouse gases into something more familiar like cars on the road, kilowatt hours, or gallons of gasoline. Do I have to create my own spreadsheet? You certainly can and there may be benefits for doing it so you can dig deeper into the numbers. But a number of different groups have created GHG calculators. 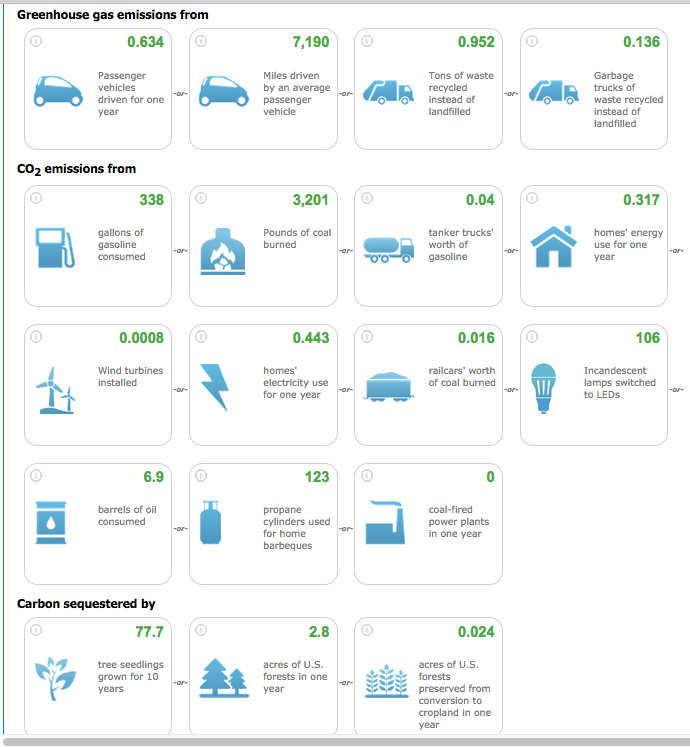 Carbon Footprint Calculator includes one for air travel. Analyze your results and take action to reduce your GHGs. What contributes most to your greenhouse gas emissions and what can you do to reduce those sources? Here are some ideas. Electricity: Where are your biggest uses of electricity? Can you switch to LED bulbs or let in more natural light? Can you change the temperature range for space heating and cooling? Don't forget 'phantom loads,' all those boxy plugs and appliance clocks that draw energy even when you're not using them. Many utilities offer green power. Businesses can for a small up-charge buy green power from APS instead of putting up their own solar panels. Travel: Can you do more virtual meetings? Can employees use alternative transportation or carpool more? Can you buy locally so materials don't come from so far away? Some travel sites like Expedia let you purchase carbon offsets when you purchase your airfare. And sometimes the answer seems too simple: UPS saved 10 million gallons of gas per year by eliminating left turns. Waste: Can you reduce the waste you generate (eg, through changing buying habits, buying in bulk, reducing packaging, reusing packaging)? Recycling many materials saves a lot of energy. Composting organic wastes (food and yard debris) still generates CO2 but that's a lot better than putting it in a landfill where it generates methane. Refrigerants and industrial gases: Can you switch to environmentally friendly refrigerants and gases? For example, at one point Nike used SF6 in Air Jordans, until they realized that gas had a CO2-e of 23900! Looking at energy through the lens of GHGs can often result in surprising opportunities that would not have appeared if you just looked at cost. For example, at a boarding school, the air travel of their international students to fly to the school may represent half of the school's climate impact. Where you can't eliminate sources of GHGs, buy carbon offsets. Economists consider greenhouse gases an 'externality,' a problem caused by a company or party that creates consequences someone else has to pay for. You may not be able to eliminate all your greenhouse gases but you can, in effect, pay someone else to reduce theirs for you, taking responsibility for your externality. Nature doesn't care who does the work; she only cares about total GHGs in the atmosphere and ocean. There is a voluntary market for trading carbon offsets and it was modeled on the very successful cap-and-trade air pollution trading system for NOx and SOx emissions, which reduced air pollution quickly at a low cost. Carbon offsets/credits are offered through brokers that connect you with projects that can reduce GHG's. This is an evolving market, still kind of the Wild West, so look for projects certified under one of several standards (eg, Gold Standard, Green-e) so you can be sure that you are getting what you are paying for: real, additional and permanent reductions in greenhouse gases. Another party with a project that, with the help of your money, can reduce greenhouse gases (eg, by replacing an inefficient boiler, changing how rice is grown, giving more efficient cook stoves to the poor in underdeveloped countries or reforesting the rainforest). Some projects have social as well as environmental benefits. A certification body that audits the project to make sure it will reduce greenhouse gases by the amount advertised and then publishes projects in a registry. A broker who markets the projects and sells the offsets to you. 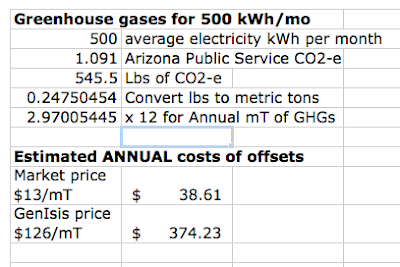 What do carbon offsets generally cost? One example is TerraPass where you can purchase offsets for about $13 per metric ton, a typical market price these days. Locally, the GenIsis Project lets you direct your offsets to pay for solar panels on the school of your choice. Rather than being a market-based price, these offsets are based on the total estimated project costs. The Alliance currently estimates these offsets at around $126 per metric ton because it must pay for the total cost of buying and installing solar panels on the school. Obviously project-based pricing is more expensive, but there are public relations benefits (and potential tax benefits) to helping local schools. Depending on the mechanism you choose and your tax status, the cost of the offset would be a business expense or donation; check with your accountant. At current market prices, paying to offset your greenhouse gases is very affordable! Imagine the same a retail store mentioned above with electricity usage of 500 kWh per month and no company vehicles. (Not counting the GHG's in optional Scope 3 associated with their products,) they would generate a little under 3 metric tons of CO2-e a year. If they purchased carbon offsets, they would pay under $40 a year for market-priced carbon offsets or $375 toward putting solar on a local school. This is a small price to be a Carbon Neutral company! If you need help doing a greenhouse gas inventory or identifying reputable offsets, please contact the Sustainability Alliance. Or see if you can get your analysis done by an intern or class project through the NAU Climate Science program.